Brief Insanity boxers. Humor and one-liners with unisex sizing that are one of a kind designs that have sell throughs in as short as one hour!! Brief Insanity lounge pants. Humor and one-liners, many of same designs as our boxers. Unisex designs and great sell through. Our Brief Insanity boxers and lounge pants are printed with a sublimation process before they are sewn, allowing incredibly creative designs that are targeted to almost every market. The soft, posh fabric is brushed at manufacturing and is of performance quality. Fab 4 - Sgt. 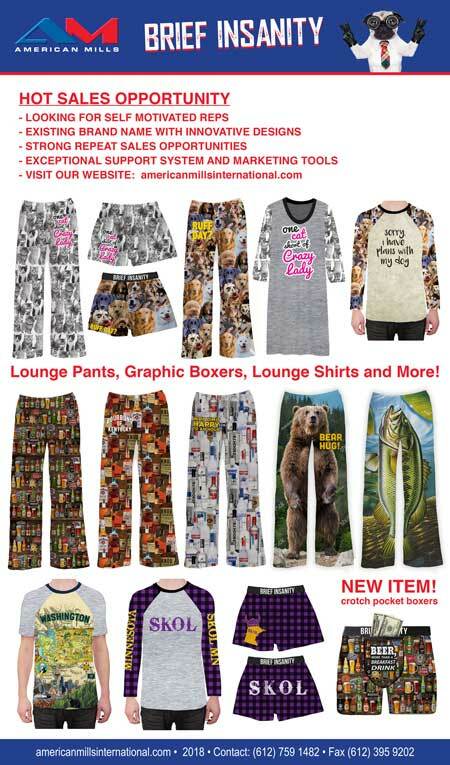 Pepper, Abbey Road and All you Need is Love designs in boxers, lounge pants and fashion scarves. Larry the Cable Guy humor boxer shorts and undies. Gift and Souvenir caps & boxers-state, resort city, including very popular animal designs for children. A sure sale for zoo gift shops. Fashion lounge pants and nightshirts and boxers for women. This is a easy opportunity for ALL GIFT, SPORT, OUTDOOR REPS to add a turnover product line that increases the bottom line of your customer. Our customers have demonstrated high sell through and re-order activity especially during holidays and major events.Seasonal sports related lounge pants and boxers sell out in an hour. Sales reps are the key to our success and we give them our highest priority. We provide you with the tools you need to sell this innovative product. Samples will be provided. Communication with our reps ensures orders placed are orders delivered, we pride in shipping orders the same day if received by noon. We have our own distribustion center. Boxers, lounge pants and sleepwear is 10%. Custom orders have small minimum quantity of 48. We have our own graphic artist. Commissions paid on the 15th of every month on paid orders. We do a lot of advertising and promotions to help support rep groups. One store sold 118 boxers in the month of December. Resort gift shop In Michigan sold 500 boxers in 4 months, they are on their 3rd reorder. One customer stated “I didn’t think dumb humor would sell so well, they are my number 1 product in store. I put them in the front of store to attracted customers"
Recently a lounge pant design was such a hit that our customer had 4 sell throughs in less than a week!